HiBoost Home 10K Plus cellphone signal booster eliminates need for integrators to erect a separate antenna, speeding up installation process. 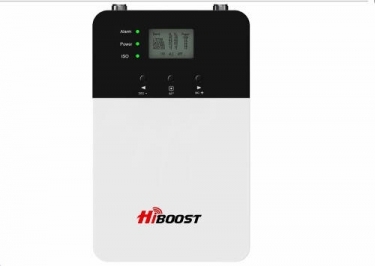 The HiBoost Home 10K Plus cellphone signal booster boosters feature an LCD screen for manually adjusting dB gain on individual bands. Ever since the cellphone signal booster category was first introduced as a viable installation accessory for custom integrators, the system topology has included the booster itself and a separate antenna required to be erected a certain distance away to be most effective. The HiBoost Home 10K Plus signal booster features a built-in antenna inside the housing of the booster effectively cutting installation and clutter by a third. This makes installation easier without any impact on the end resulting signal, according to the company. Because versatility is important, the booster features ports to allow for additional indoor antennas to be used to customize the signal solution to the layout of your home or office. Lastly, considerable time was spent having a European designer create an appealing aesthetic to the booster to make it a fashionable part of one’s home or office. “Our boosters are the most powerful and best performing on the market,” says Marcelo Palazzo, sales manager at HiBoost. “We provide boosters appropriate for small homes/offices on up to large office towers. Our remote monitoring system is an excellent way for integrators to create a recurring revenue stream. Integrators really appreciate that we don't sell direct to consumers and we provide tons of training and troubleshooting materials. We also support integrators by providing installation leads. Built-in antenna allowing for easier installation, with the option to use additional antennas for added flexibility in solution design. Sleek and appealing aesthetic designed by European interior designer to tastefully match home decor. HiBoost Smart Link technology allowing for remote monitoring and troubleshooting. The company notes installation of the device eliminates the potential unsatisfactory loss of signal from a non-optimal donor antenna. The Home 10K Plus can accommodate optional additional antennas to distribute signal in places that would not be covered by the original placement.